In the third round of the Champions League, Vive Tauron Kielce beat Motor Zaporozhye 30:26 and stays at the top of the group D. As much as the final result isn’t really surprising, the course of the game itself was. Poles have been in a good form lately so a match against team from the bottom of the group table was not expected to be that dramatic. 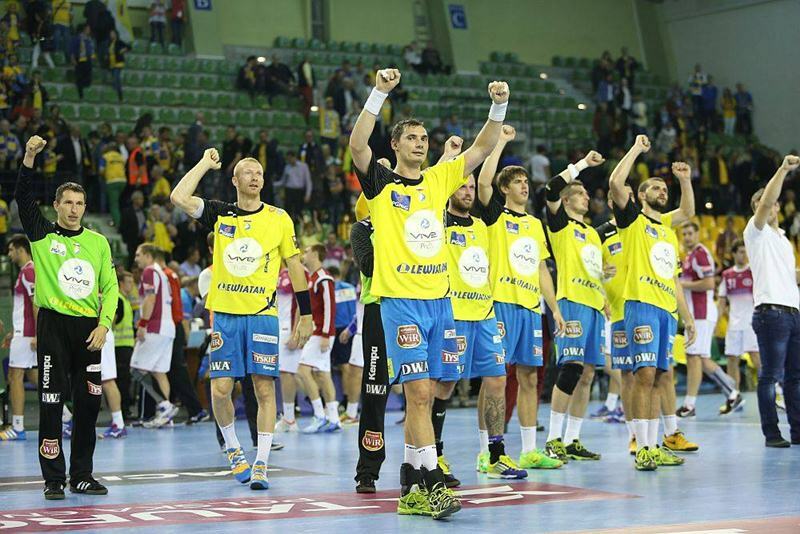 Three injured Kielce players – Aginagalde, Buntić and Rosiński – had to watch their mates from backseats. Beginning of the first half was full of all kinds of mistakes made by both teams. Kielce took the better start but the result could have been much better for them if they had made most of their many chances; they wasted even their first penalty shot when Ivan Čupić tried to lob the Zaporozhye goalkeeper. In the 8. minute the crowd saw rather unusual situation when, in the face of Aginagalde’s absence, a defence player Grabarczyk joined his mates in attack. He even managed to throw Sergii Burka out of the court for 2 minutes. After 10 minutes Kielce were away by 2 goals (5:3) but in a few minutes, mostly thanks to Tkaczyk, the gap reached 4 goals (10:6, 15. minute). The team had its ups and down, usually due to poor efficiency in attack, but they didn’t lose the lead. In 25. minute Lijewski made the result 15:10 but fell on the floor and wouldn’t get up for quite a while. Having in mind Buntić’s injury, losing Lijewski would have been a great problem for Kielce, but the player finally got up and continued playing. Polish defence could not stop Motor pivot and Ukrainians made a use of this. End of the first half showed that (not that) old Kielce nightmare might have come back – Tkaczyk’s penalty throw was saved by the Zaporozhye goalkeeper and the half time result was 17:14. First minutes of the second part belonged to the team from Ukraine. Ivan Čupić missed his second penalty shot – it was a copy of his first one, with exactly the same result. Kielce started hitting goalposts or losing ball and Zaporozhye needed 5 minutes to equalize at 17:17; they even had a chance to take the lead but they were denied by Marin Šego. Good defence, stolen balls, fastbreaks and Michał Jurecki allowed Kielce to take 5-goal-lead in 43. minute. However, Motor stormed ahead and 6 minutes from full time they equalized at 26:26. A surprise was in the air but Marin Šego decided to intervene. The crowd went wild when he denied 2 penalty throws; great Lijewski scored 3 last goals and made the final result 30:26. ← Previous Story “Lions” lost in Vardar’s lair – Veszprem outplay Montpellier in last attack! Next Story → ASOBAL (Round 6): Cuenca with the first win!